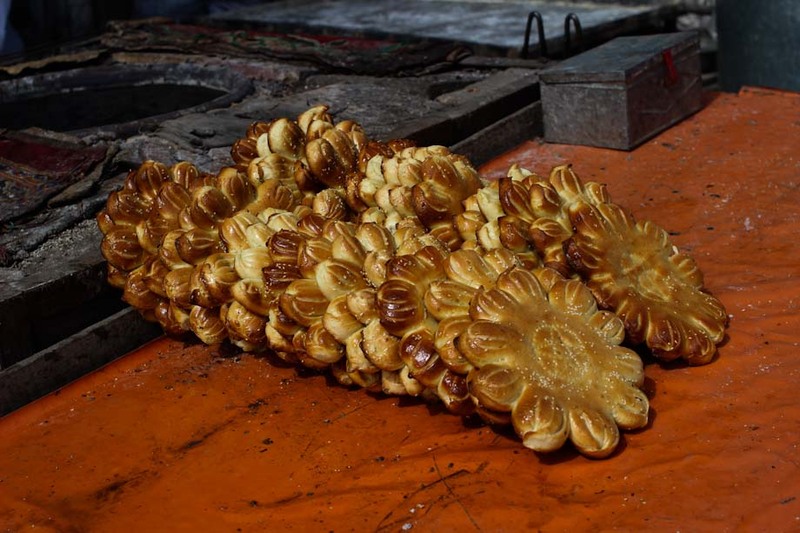 When I talk about “Xinjiang food” I refer to the traditional Uyghur cuisine. The reason is that here about half of the population belongs to the Uyghur minority, a Muslim ethnic group that has its own language and culture. 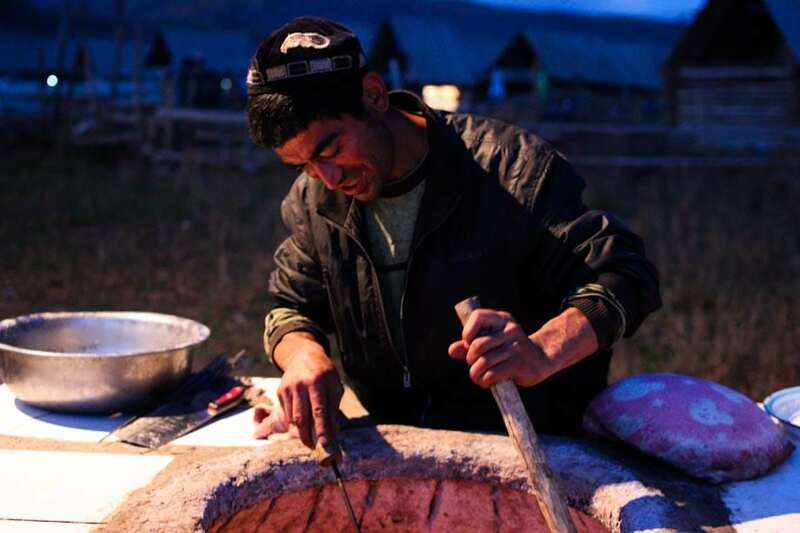 Even if Xinjiang is part of China, its food shares much more characteristics with the Turkish and Central Asia food. So, every time I need a break from Chinese cuisine, I go to a Xinjiang restaurant (they are all around China). Even if Xinjiang represents about the 15% of the whole Chinese territory, its land is mostly composed by deserts and mountains. Hence there are very few vegetables that grow here, almost only onions, carrots, peppers and tomatoes. You do get a lot of fruit, especially in summer. Grapes, melons, watermelons, peaches and figs are the most common. 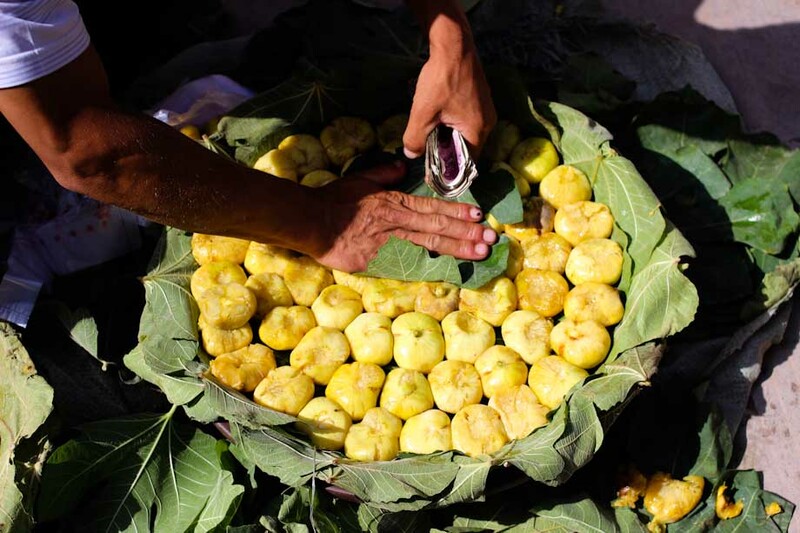 You can follow the link above to learn more about the fruit market of Kashgar, a town situated in the extreme West of Xinjiang. And then you get the meat, a ton of meat. However, since Xinjiang people are Muslim and don’t eat pork, the choice is limited between beef and mutton meat. 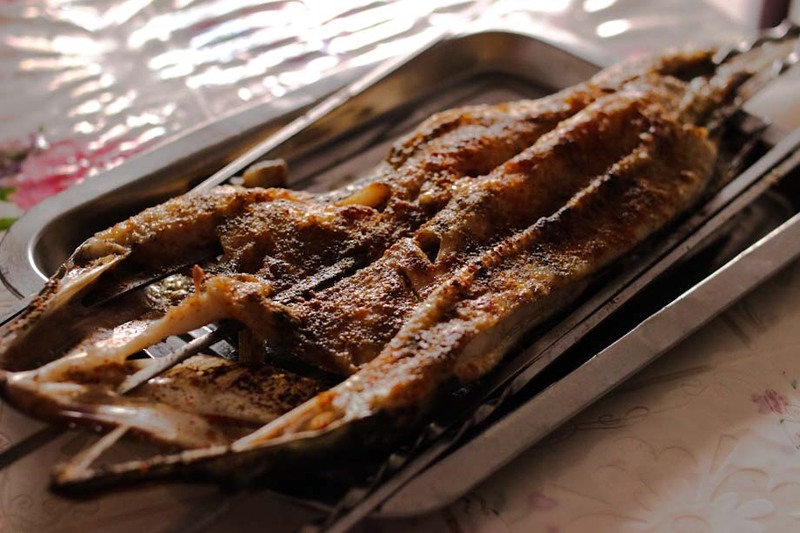 Mutton (or sheep) meat is by far the most common here in Xinjiang, to the point that you can find a mutton kebab’s stand in pretty much every corner of Kashgar or Urumqi, the capital of the province. 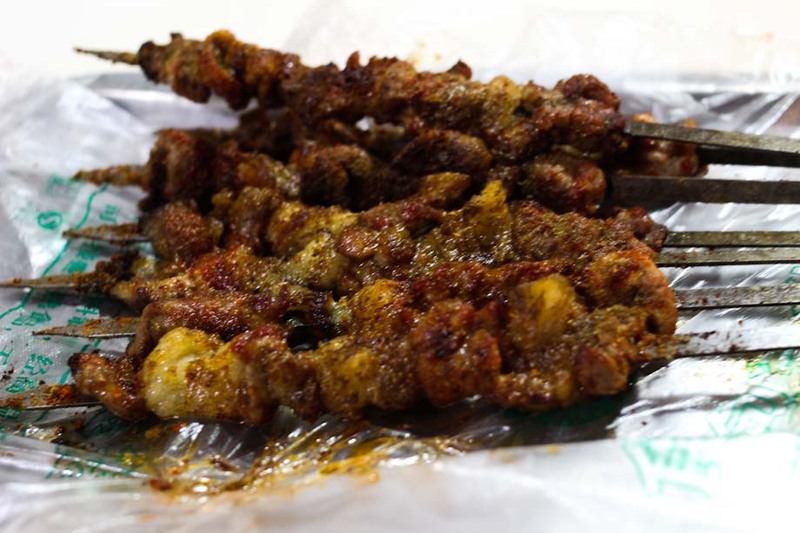 The photo above shows the classical mutton kebabs from Kashgar. They are composed by three pieces of meat and one piece of fat. While the food in Xinjiang is usually quite spicy, I was surprised to find out that the kebabs prepared in Kashgar only have salt and some light spices. 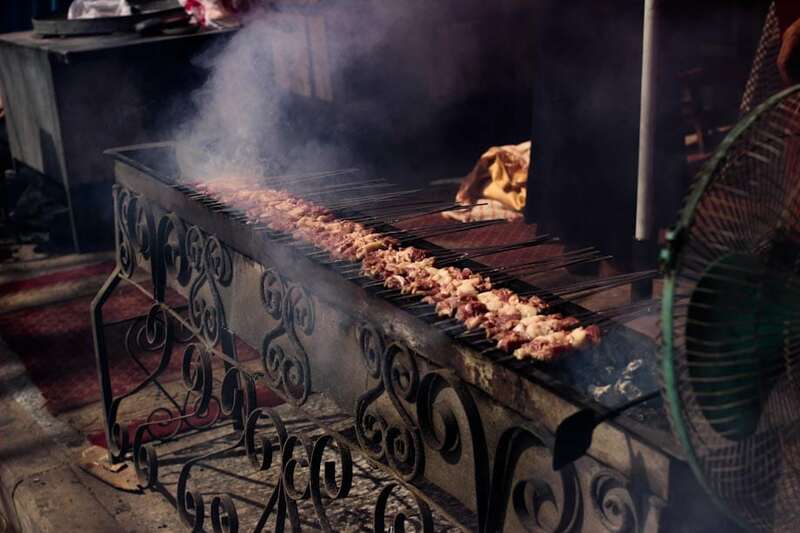 The photo above shows the roasted kebabs (kawap in Uyghur language) stand that was just below my hostel in Kashgar. The flavor of sheep pervaded the whole street. I bought the kebabs on this photo in Urumqi, in East Xinjiang. You can see by yourself that they have way too much spices. It was even difficult to taste the meat. Those are the kind of mutton kebabs that you can find all around China. Xinjiang is a poor province and many Uyghur people left their hometowns to work in East China, which offers more economic possibilities. Personally I prefer the kebabs from Kashgar. The price for a mutton kebab ranges between 2 and 5 RMB (1 RMB is the equivalent of 0.16 USD). This originally wasn’t an Uyghur dish so even Uyghur people call it in Mandarin. The Chinese term da pan ji can be translated as “big plate of chicken.” The name is quite accurate. The da pan ji is a spicy chicken soup with potatoes, peppers and onions. As you can see on the photo below, you can ask the waiter to add some noodles (la mian) to complete the dish. 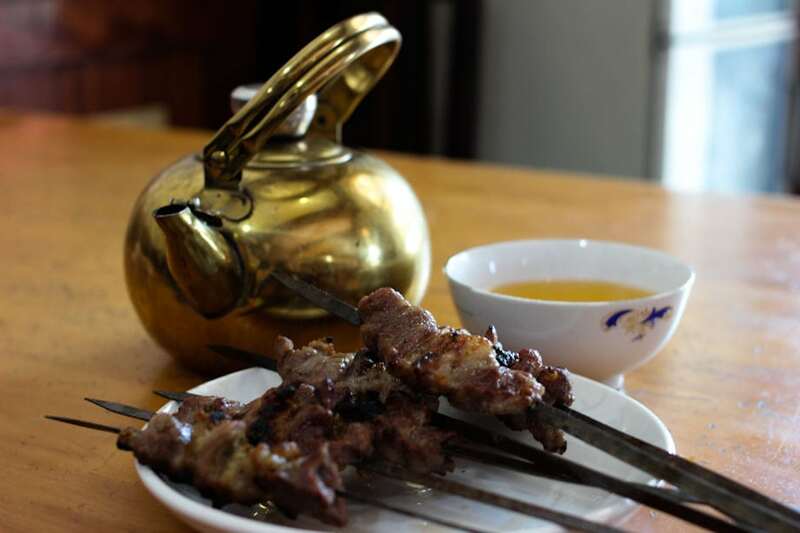 This is one of my favorite dishes and, as for the mutton kebabs, you can find it all around China. You just have to look for a small restaurant (they usually look quite poor) owned by Xinjiang people. The best way to find them is to look for a panel that says 新疆 (it means “Xinjiang”) or 大盘鸡 (it means “da pan ji“). The price for da pan ji ranges between 40 and 80 RMB (according on the restaurant) while the xiao pan ji is about the 30% less expensive. In Xinjiang the staple food is the wheat (instead of rice as in most part of China and South East Asia). 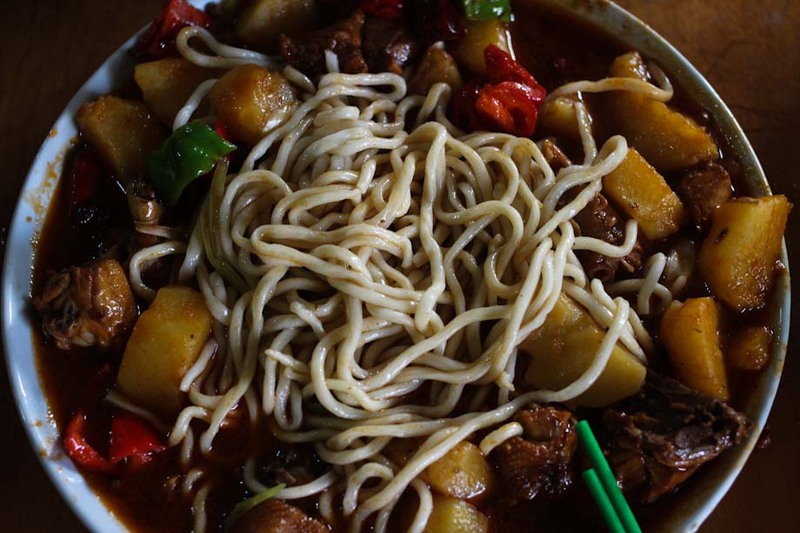 The laghman, hand made noodles with mutton meat, onion and peppers, are especially popular. 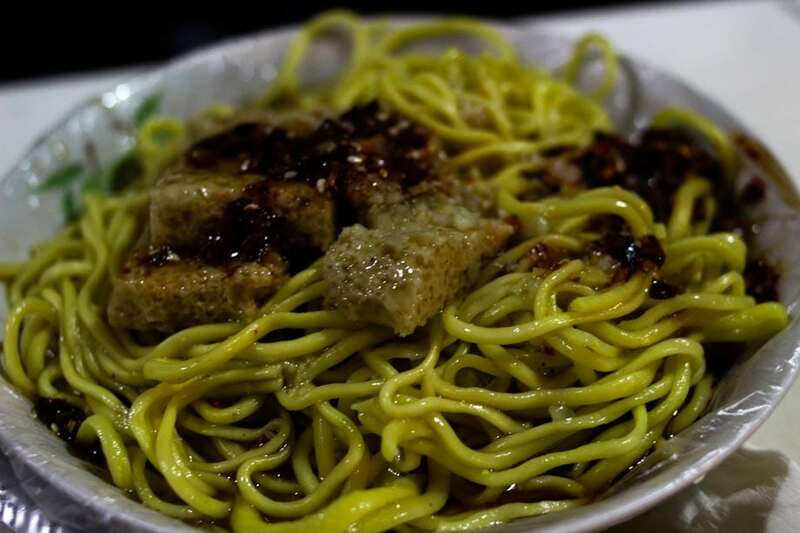 If you are visiting Beijing, Shanghai or any other Chinese city and you aren’t able to find a Xinjiang restaurant, you can still look for a 兰州拉面 (Lanzhou lamian) restaurant, which can be found in any corner of every Chinese city. 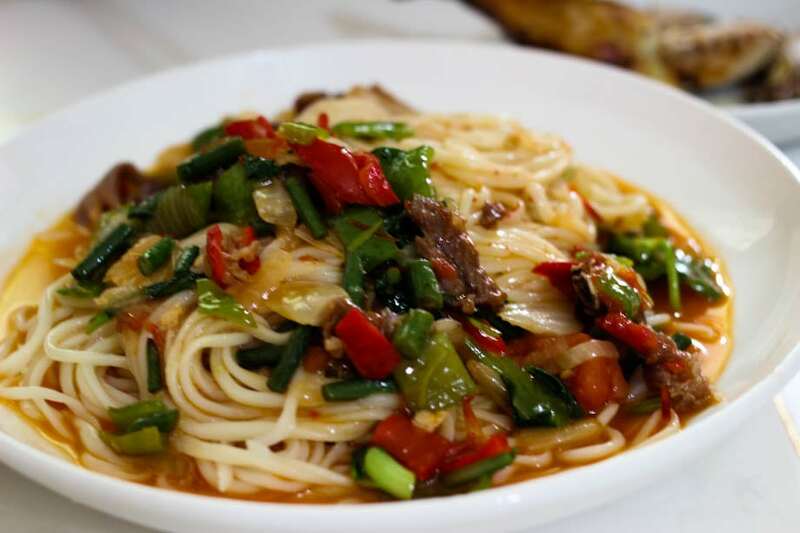 Lanzhou is the capital of Gansu province, which is close to Xinjiang, and the noodles that you’ll find here are quite similar to the ones that you can find in Xinjiang. 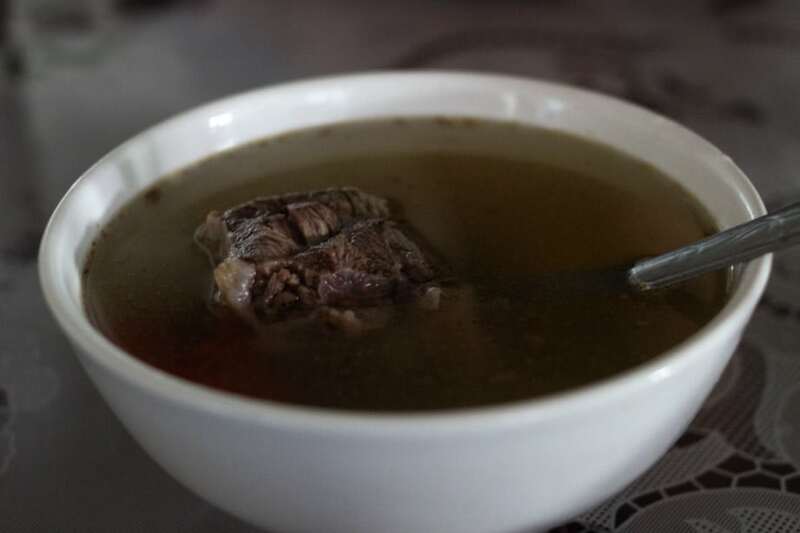 However the choice in a Lanzhou lamian restaurant is limited and you can’t get the other dishes typical from Xinjiang (da pan ji, mutton kebabs and so on). Sometimes you can’t even get a Coca Cola. I took this photo in Kanas (a touristic town in the Altai Mountains, at the border with Russia and Kazakhstan). The cook also added a bit of tudou si (sliced potatoes) and the dish was especially tasty. I bought these noodles near the bus station of Urumqi. 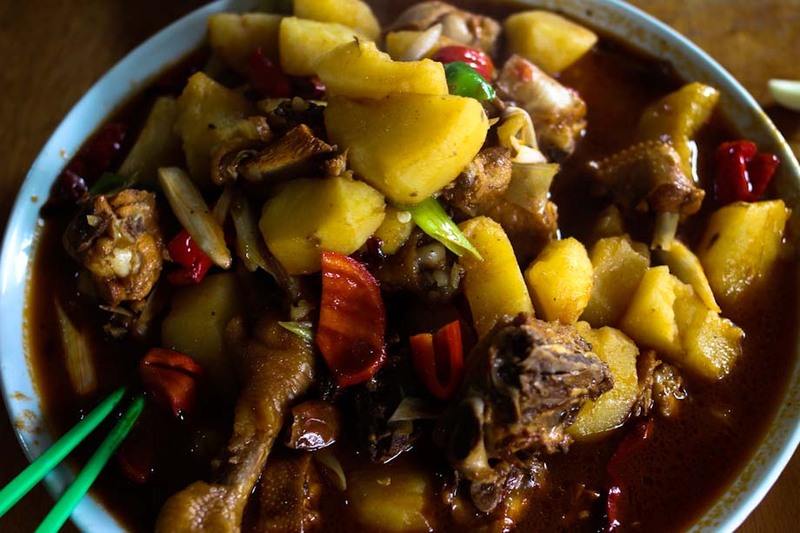 This isn’t a Uyghur dish, it’s actually a Hui dish (the Hui people are another ethnic minority of Xinjiang Province). As you can see this is a poorer version of the previous dishes as it comes without meat and vegetables. I was indeed disappointed! 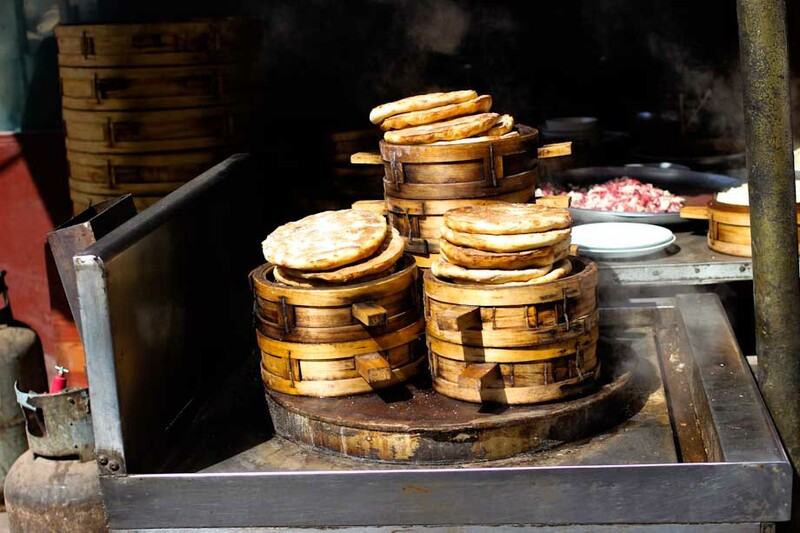 Even if the main staple food of Xinjiang are the noodles and the naan (the flat Muslim bread), you can still get some rice, especially in East and North Xinjiang (I didn’t see any rice in Kashgar). 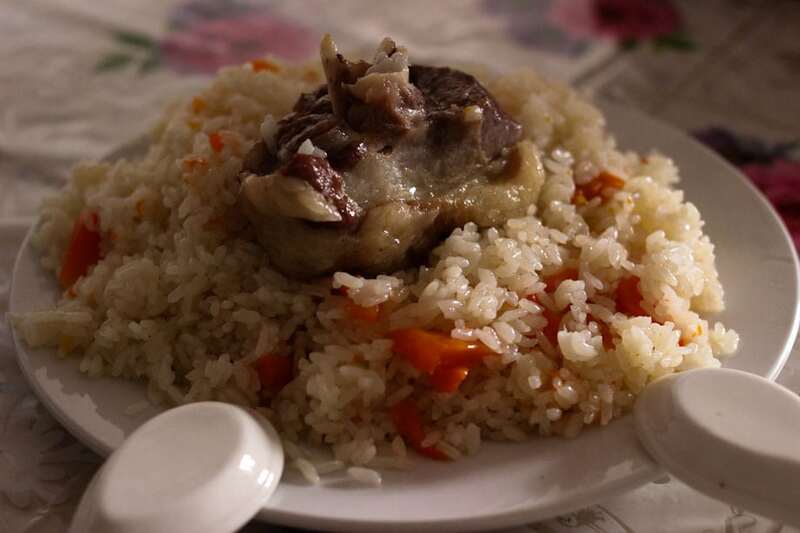 In particular, you can find the fried rice cooked with vegetable oil, carrots and mutton meat. It’s quite tasty but be careful because it’s not so easy to digest. 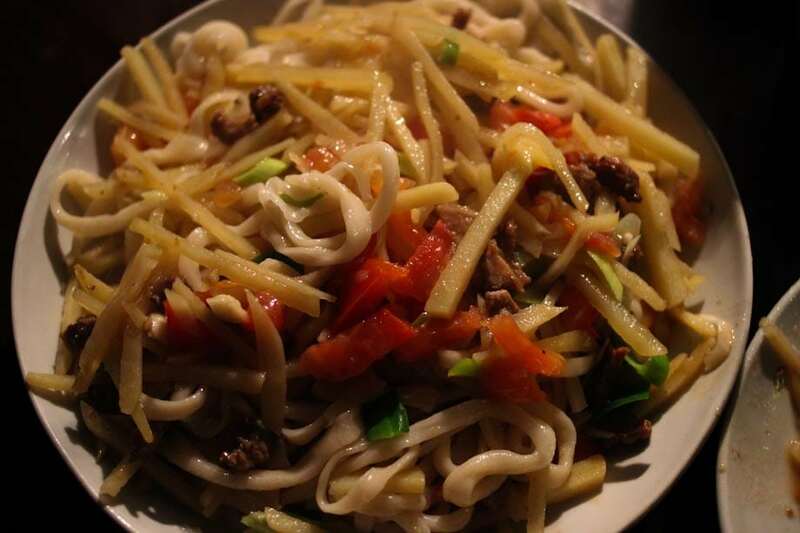 This dish is called polu in Uyghur and zhua fan in Mandarin. 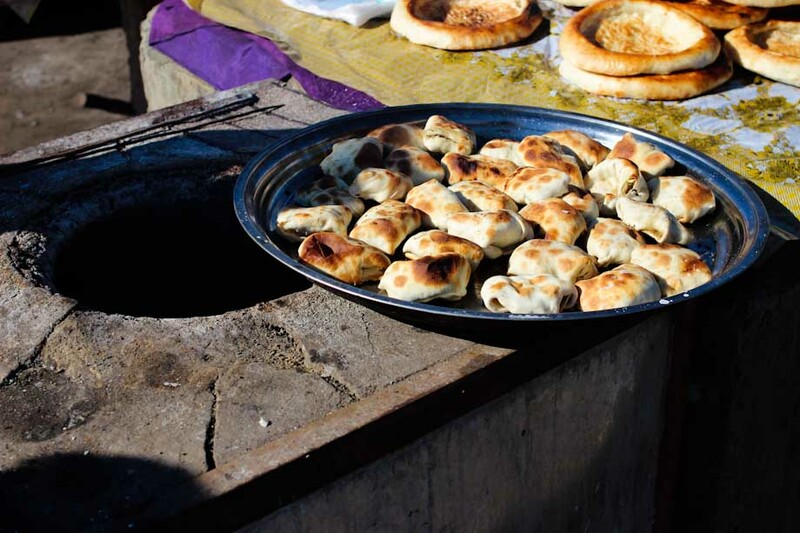 In Xinjiang you’ll find the naan. 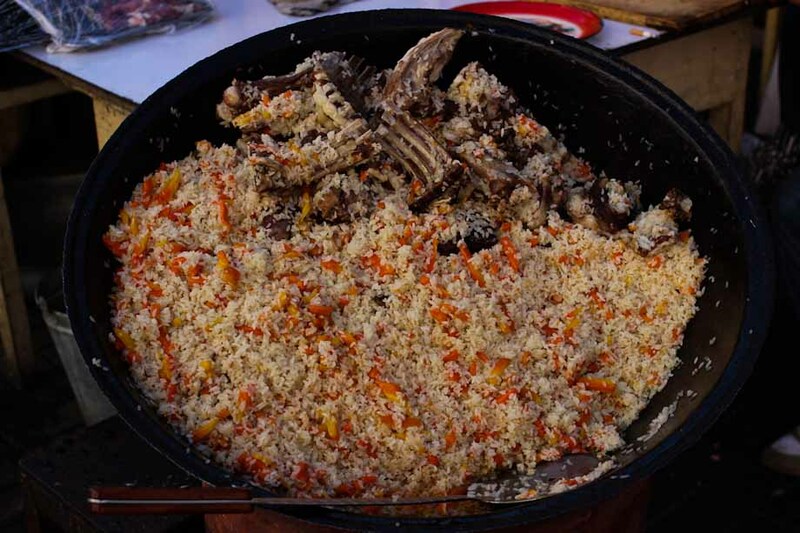 It usually cooked in a portable oven and sold on the street (see photos below). 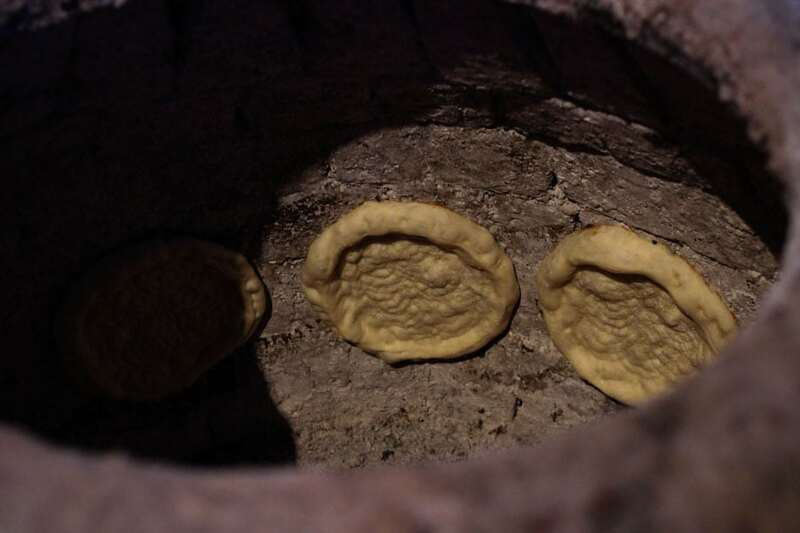 The technique for cooking the bread is quite interesting as the baker pastes the bread on the internal side of the oven. This guy was selling his bread in Hemu, a touristic village in North Xinjiang. This is another dish that I love. I order it every time that I go eating in a Xinjiang restaurant. The pastries are generally filled with mutton meat. 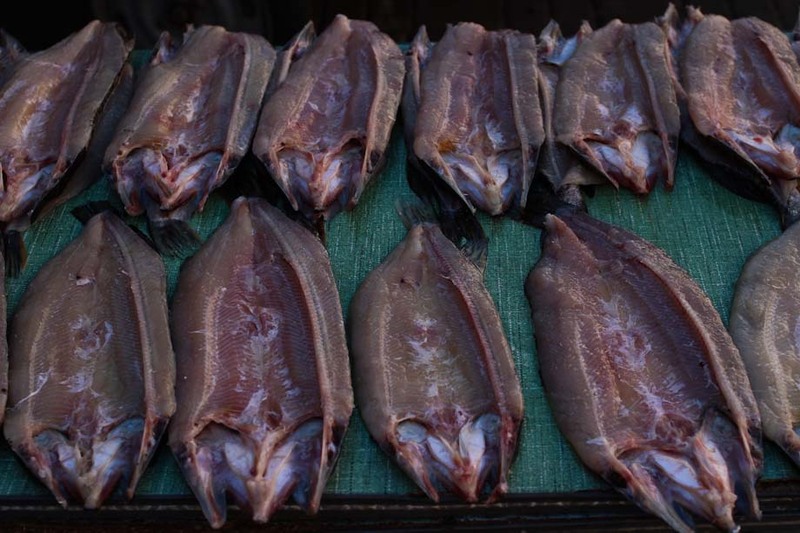 Xinjiang isn’t the place to go for eating fish as it’s one of the further regions from the sea in the whole world (together with Kazakhstan). However in the Altai mountains there are several lakes and you can get some fresh fish. I find it to be expensive (but in Altai everything is expensive) and not really tasty. So I won’t recommend it to you. However I may be biased as I come from Sardinia, an Italian island where the fish is particularly good. As I said, you’ll find a lot of fruit in Xinjiang. 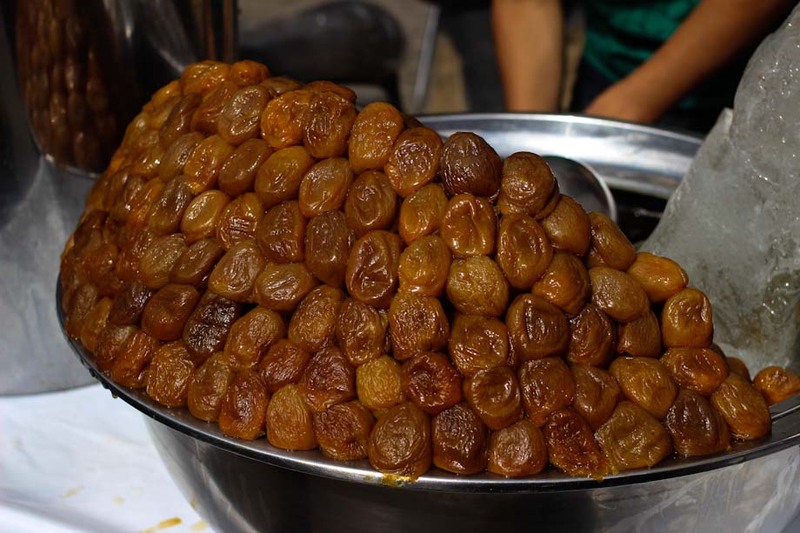 But what caught my attention were the figs that I saw (and ate) in Kashgar because so far I had only see figs in the Mediterranean countries. So I want to let you with some nice photos of figs. I must thank Grace for pointing out, in the comments below, some mistakes in the names of the dishes. Do you like mutton meat? What’s your favorite Chinese dish?